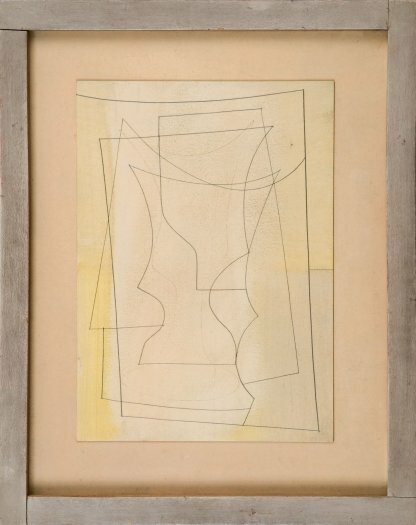 The dynamic and vigorous activity of line within Feb 10-52, presenting objects overlapping and interpenetrating, plays to the idea that this work forms as an equivalent for Nicholson's perceptive experience of activity in three locations that he visited at this time - St Ives harbour, Yorkshire and Italy. In the 1950s Nicholson joined together natural colour, table-tops, still-lifes, the fragmentary Cornish harbour, the Yorkshire countryside, and the Italian landscape, positioning them together on reliefs of overlapping planes. The still-lifes (the bottle, the glass, mug and jug shapes) were a useful form to replace the square and the circle, because they had more variety. The still-life motifs had little presence as objects because they had no volume but were a means to introduce rhythm and movement across a surface. Nicholson's previous concern in the reliefs of the thirties for physical depth had now been exchanged for works with little or no sense of depth. 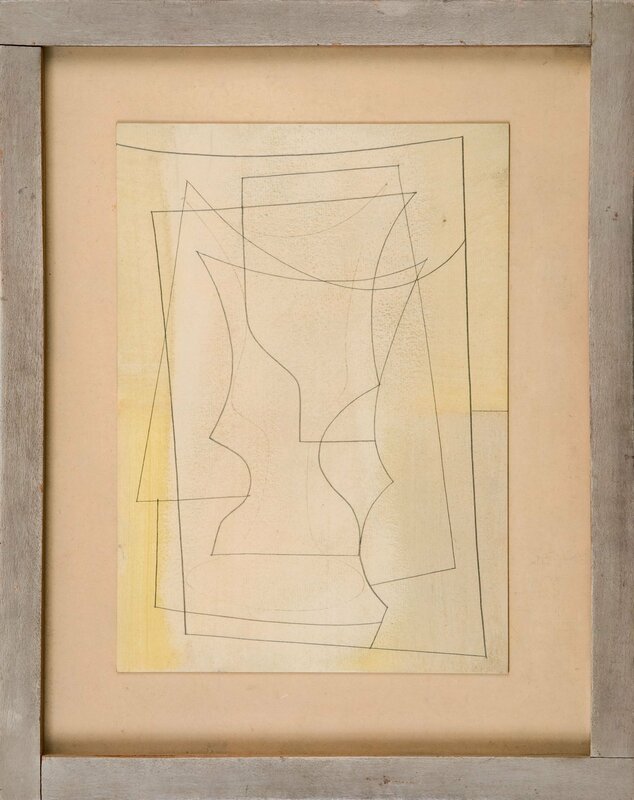 Nicholson appears to have an overriding focus on the surface of his works in the 1950s and he accordingly drew attention to it with sweeping , crisp pencil lines which skate over the top without penetrating the plane. The still-life compositions described by these lines often suggest building structures in the landscape, built up of intersecting planes with a complexity reminiscent of the church architecture which Nicholson loved to draw in Yorkshire and Italy. No more so than in the years between 1951-3 was Nicholson so intent on presenting a more linear depiction of the object. Consequently, the works from this time are, every so often, almost completely devoid of colour. In the fine example, Feb 10-52, we witness a linear design laid over delicate washes of colour. There is a tension in the razor sharp lines and this keenness must have developed out of Nicholson's experience of minutely differing depths of plane in the relief, as well as from his increased drawing activity during the war. Indeed drawing had now become an important part of his working method as a means of investigating form. Feb 10-52 was created at a time when Nicholson's career and international standing was flourishing. Nicholson was promoted in a series of exhibitions mounted by the British Council in Venice and Sao Paulo among other places, and he began to exhibit regularly in North America and especially New York. In the 1950s Nicholson was to gain a plethora of awards, gaining first prize for painting at the Carnegie's 39th International Exhibition 1952, the Ulisse Award at the XXVII, Venice 1954, the Grand Prix at the fourth Mostra Internazionale di Bianco e Nero, Lugano 1956, First Guggenheim International painting prize 1956 and first prize for painting at the IV Sao Paolo Bienal 1957.